Easy DIY installation - bolt on application & low voltage power. Overhead mounting allows for maximum horizontal car clearance. Access compatible with intercoms, keypads, remotes, and more. Battery back-up capability for stormy days. Available photo-eye safety to protect cars from impact as well as built in obstruction sensing. 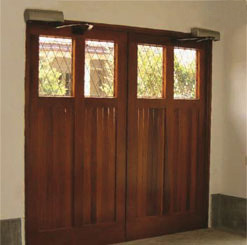 Soft stop performance - slows the doors at the end of cycle to prevent stress on doors and openers. 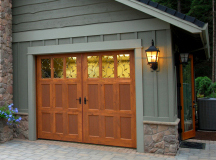 A market first - carriage garage door automation that fits most applications. The Estate Swing Carriage Garage Door Openers are the first of their kind; Do-It-Yourself carriage door openers that can be installed using low voltage power and back-up battery ready. 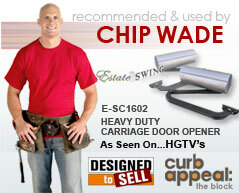 CarriageDoorOpeners.com has teamed up with Estate Swing to bring you this marvel of simplicity and power. The Estate Swing Carriage Door Openers are built to the highest standards world wide. Each unit is put through rigorous quality controls adhering to ISO 9000 regulations and comes fully backed by CarriageDoorOpeners.com 7 day support. You couldn't ask for a better combination: technology, quality, support, flexibility and availability all wrapped in one UPS/Fed Ex deliverable package. Safety is our top priority. The Estate Swing automatically reverses directions when it comes in contact with an obstruction. The Estate Swing also has the safest method of controlling safety devices. All safety devices are set up on a Normally Closed circuit. What this means is that the Estate Swing is virtually fail-safe, if the safety device doesn't function neither will your door opener. We encourage uniqueness and simplicity; most companies either force you into accessories you don't need or limit you to only their brand of accessories. We provide Estate Swing's well priced, high quality accessories or our alternate brand accessories with alternate capabilities and rock-bottom pricing. Thus letting you customize the features you need and leave behind the features you don't want. The Carriage Door Openers comes with 2 remotes to open and close your doors - you can add back up batteries, extra remotes, alternate gate opener matching receivers, keypads, photo-eyes, push buttons, lamps, door locks, and more. Copyright © 2002- 2019 Web Direct Brands Inc, All Rights Reserved, We Ship Worldwide.